✔Dell Precision T3610. ✔500gb ssd sata hard drive as primary and 2tb sata as secondary drive. ✔Xeon E5 -1620 @ 3.70ghz. BASE UNIT ONLY WITHOUT MONITOR, KEYBOARD, MOUSE OR POWER CABLE. ☑Anti Virus Installed. Model: T3610. Hard Disk Drive Storage: 500GB. Machine Type: WORKSTATION / TOWER. Manufacture: DELL. Product Line: PRECISION. Power Lead: INCLUDED. DELL PRECISION T3610. 3TB SATA HARD DRIVE. dell latitude 6430u ultrabook laptop i5 3437U 8gb ram 128gb SSD win10 GAMING (#273740464079) £165.00 View Item. dell latitude e6440 core i5-4310m 2.7ghz 8gb ram 1TB hdd HD 4600 GRAPHIC GAMING (#273759145208) £185.00 View Item. Storage (2.5" SSD HDD): 256GB 1.5TB. Graphics Card: AMD Radeon R9 290 (4GB GDDR5). We can only apologize for this, and hope this does not cause you any problems. BER (Beyond Economical Repair). Okay Condition – Large Dents, Cracked Casing etc. Storage (2.5" SSD HDD): 240GB 1.5TB. Graphics Card: EVGA 780 Ti SC (3GB GDDR5). NO power lead, mouse, keyboard or ANY other accessories included. BER (Beyond Economical Repair). Okay Condition – Large Dents, Cracked Casing etc. Storage (2.5" SSD HDD): 256GB 1.5TB. Graphics Card: EVGA GeForce GTX 780 (3GB GDDR5). We can only apologize for this, and hope this does not cause you any problems. BER (Beyond Economical Repair). Dell Precision T3610 - MT - Xeon E5-1607V2 3 GHz - 16 GB - 512 GB SSD - 2 TB HDD - NVIDIA Quadro 2000D & AMD FIREPRO 2270. Model T3610. Installed Size 4 GB / 128 GB (max). Installed Size 16 GB. Manufacturer Dell, Inc.
Dell power adapter. B Grade : “Grade B” PCs are fully tested and fully functional but subject to have: light scratches on external body and may feature more excessive unit housing and/or external case wear than Grade A units, including wear on case / lid. Dell Precision T3610 PC Desktop. This PC has a DVD drive and it is working. This workstation may show light scratches (see pictures). Included: Dell Precision T3610 Workstation and power cord. Dell Precision T3610 Workstation. 2x Nvidia Quadro K4000 GPU graphics cards. 64GB PC3-14900 1866MHz DDR3 RAM. This computer is used, refurbished and in very good condition. Includes power cable. Pictures are of one computer from a quantity. 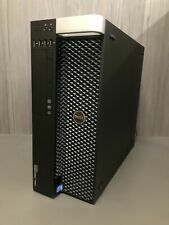 Dell Precision T3610 desktop 16GB E5-26509 V2 1TB. 32GB ECC DDR3. Processor TypeE5-2609 V2. Video Card Optical Drive Form Factor. DELL PRECISION T3610. XEON E5-1607V. Hard Drive. Software/Data Recovery is not covered under Warranty. Whether it's a laptop, desktop, LCD, printer or one of our other amazing deals, each piece is coming to you off-lease. 128 DDR3(16GBx8). Model: T3610. (See pictures for details). Manufacturer: Dell. E5-1607 v2. We cannot be responsible for malfunctions caused by user operation of software installed by either Good Used Electronics or by a user. Dell Precision T3610 CTO Workstation. 240GB 6Gb/s SATA 2.5" SSD Solid State Drive. nVidia Quadro 2000 1GB GDDR5 DVI Dual DisplayPort PCI-e Video Card. (Total 8x DIMM slots). Dell Precision T3610 - MT - Xeon E5-1607V2 3 GHz - 16 GB - 256 GB SSD - 2 TB HDD - NVIDIA Quadro 2000D & AMD FIREPRO 2270. Model T3610. Installed Size 16 GB / 128 GB (max). Installed Size 16 GB. Manufacturer Dell, Inc.
Ram: 16 GB. # USB Ports: 10. Extra Ports: Mic / headphones/ Ethernet. Processor: Xeon (R) CPU E5-1607 v20. Output: VGA, DVI, HDMI. DVD/RW: DVD RW. Dell Precision T3610 Tower Workstation. Dell Precision T3610. Dell Lite-On 256GB SATA-3 2.5" Solid State Hard Drive. HPE, Dell, IBM, SUN Servers. HP, Dell Workstations. Systemax Technologies Pty Ltd is a trusted supplier of servers, options, storage and networking products, server racks, high end workstations and much more to organisations throughout Australia. Hard Drive Capacity 2 x Seagate 900GB 10K SAS Hard Disk Drives (ST900MM0006 | 2RR9T). Video/Graphics Card NVIDIA Quadro K600 AMDFireGL V5600. We have offices on both the east and west coasts, utilizing a combined total of 50,000 square feet. Good working condition. Pictures are actual of the Desktop. Dell nVidia Quadro K4000 3GB GDDR5 PCI-E Video Graphics Card D5R4G. No accessories. No DVD Drivers. Item is warranted to be as specified in the above details, and in good working order (unless stated that it's condition is unknown). Dell Precision T3610 PC Workstation, 1x E5-2665 2.4GHz 8 Core, 96GB DDR3, AMD Firepro V4900, 480GB SSD, Win 10 Pro (Certified Refurbished). System: Dell Precision T3610 Workstation. Video Card: AMD Firepro V4900, 1GB GDDR3, Outputs: 2x Display Port 1x DVI. Lot includes 6x Dell Precision T3610 Workstations. 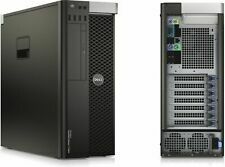 Dell Precision T3610 Specifications 2x Nvidia Quadro K4000 GPU graphics cards. 64GB PC3-14900 1866MHz DDR3 RAM. Windows 10 Pro 64-bit installed, with Windows 8 sticker.